In the remote northeast corner of California, up a long and steep forest service road, runs a tiny creek which holds a native redband trout known as the Warner Lakes redband. Inland redband trout are defined as an all inland, nonanadromous rainbow population. According to Behnke, several desiccated basins west of Alvord Basin and north of Lahontan Basin hold redband trout as their native trout species. One of those redband trout holding basins is the Warner Lakes Basin. The redband is a unique subspecies adapted to the Warner Lakes Basin ecosystem. In fact, these redband trout constitute a significant percentage of Warner Basin fishery. In these closed high desert basins, redband trout have evolved to survive in environments with vast extremes of both water flow and temperature. According Behnke, Warner Lakes redband are one of only eight separate desert basin populations of interior native redband trout. The Warner Basin is between Catlow Basin to the east, and the Chewaucan and Goose Lake Basins to the west. Again, according to Behnke, the Warner redband trout are likely most closely related to redbands native to the Goose Lake and Chewaucan River Basins. 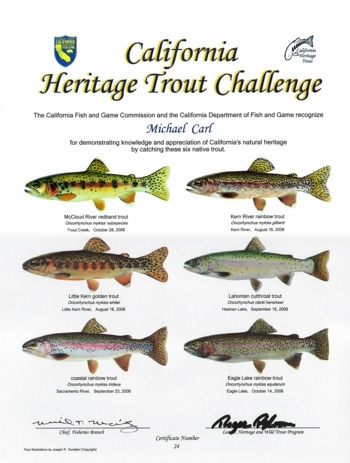 Catch, photograph, and release the Warner Lakes redband along with five other different forms of California native trout from their historic range and California Department of Fish and Game will send you a personalized certificate featuring the art of Joseph Tomelleri (similiar to this one).